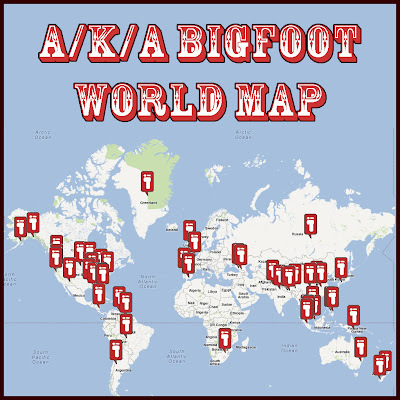 Click and interact with The AKA Bigfoot World Map below. Every foot print below is a bigfoot variant. From the Almasty to the Yowie you will find it on the map. If you have any we have missed, please submit them to Feedback@BigfootLunchClub.com. You can also click on the following link to go to the full-screen version of International Bigfoot Variant Map. This is pretty awesome Guy! Thanks Ro! I love that some form of the "wild man" is all over the world. Wow, Guy! This is one of the most interesting bits of Bigfootery I've seen lately. Cheers to you for posting this! Why thank you! You can get lost in it for quite a while. I found this site on a link form ABOUT Paranormal that mentioned Barnsville. As a property owner in Jackson TWS, Monroe County, it peaked my interest. I live elsewhere but still have an interest in SE Ohio. I really like this site. I believe Bigfoot exist and wish the hoaxers would stop inhibiting serious research in verifying Bigfoot. I have some ideas which I will share with the group that may capture a photograph of the creature. I also think BF may be another race of Homo Sapien. Your information on the Spanish Bigfoot is wrong...Andalucia and Basque Country are two totally different areas of Spain. Andalucia is in the south, Basque Country is in the north. We removed the reference to Andalucia and moved the pin to Basque Country. Thanks for the help!! !